The new ŠKODA KAROQ​ takes the traditional SUV to a whole new level. the new design of the Karoq sets an entirely new benchmark for SUV's. The KAROQ​ is unveiled in Stockholm on Thursday 18th May with the market launch following on later in 2017*. The name KAROQ​ has been based around the language of the Alutiiq tribe who are inhabitants of an Island in Alaska. 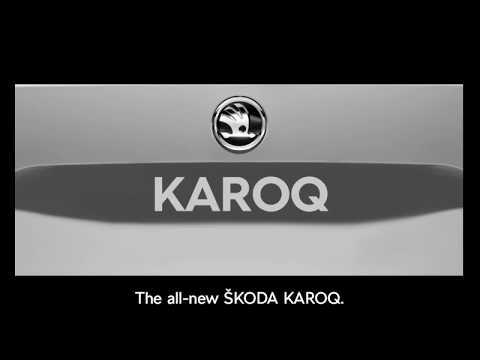 The name KAROQ​ was created by combining the Alutiiq word for 'car' which is 'kaa'raq' and 'ruq' meaning arrow - representing the symbol for ŠKODA's logo. This language was also the inspiration for the newly released KODIAQ. the names for ŠKODA's future SUV's will also follow this pattern. ŠKODA's KAROQ​ showcases with its individual brand identity alongside its resembling product identity. ŠKODA are taking the next steps in the SUV field. Inside the KAROQ​ you have brilliant LED ambient lighting found in the décor strips of the doors and dashboard, they can be set in 10 different colours. The boot has a hands free opening option thanks to the virtual pedal. There is a generous amount of space in the boot with a capacity of 521 litres with the rear seats up. to increase the space the rear seats can be folded down to provide a massive 1,630 litres of space. There is an optional rear seat configuration called Varioflex giving the boot a capacity of 479 and 588 litres. The Varioflex offers the option of completely removing the rear seats to offer a maximum loading space of 1.810 litres. Along with a towing weight of up to two tonnes the KAROQcan cater to a magnitude of different requirements, from a weekend at the beach to moving home. The ŠKODA KAROQoffers a wide range of driver assistance systems. The new systems include the benefit of Parking assist, Lane Assist, Traffic-jam Assist, Blind Spot Detect, Front assist with predictive pedestrian protection, Emergency assist and Tow assist- with the ability to tow trailers weighing up to two tonnes the new trailer assist helps you when you are reversing slowly and manoeuvring. Additional driver assistance systems are also available for the ŠKODA KAROQto ensure the car is kept at a safe distance from the car in front. You can also benefit from the vehicle recognising traffic signs and flagging them for your attention. To keep up to date with the latest news, press releases and be one of the first to experience the all-new ŠKODA KAROQ​ at our launch event, why not register your interest today by calling us in branch or by completing an enquiry form? Alternatively, follow us on Facebook and Twitter, where we share the latest news from Birchwood and ŠKODA UK.